The following is a part deux of a short, but ever-growing list of books that Ms. D feels belong on the shelves of Destitute and Obscure homes all over the world. They are practical, savvy little tomes to use as a reference for life. As before, feel free to make suggestions for making this list longer and more diverse. All links here should take you to Powell’s Books in Portland– a one-of-a-kind, definitely NOT Amazon used and new bookstore worth supporting if you order online. Otherwise, please go to your local, lovable INDEPENDENT bookstore to fondle or order your own copies. This book is written by an expert, and it’s completely readable. Chris Farrell is the Economics editor for NPR’s Marketplace Money, so he has a clue about money, and more than a few about life. In the book, he explains the merits of different forms of investment, from all the reasons why an employer-sponsored 401k continues to be a good idea, and how exactly to start saving for your child’s college education— itself a priceless investment. Best of all, it’s written in plain English (the language I speak) and has those nifty little sidebars with bulleted lists and resources. It really couldn’t be easier to understand, whether your Destitute and Obscure or otherwise. One of his best examples of ‘the new frugality’ would be to invest in a high-end, well-equipped bicycle and ditch the car (especially the second car). While a grand or more may seem extravagant for a bicycle, it’s not so much when you figure that you won’t have to put gas in it (aside from making sure you’ve eaten a healthy breakfast) give it an oil change, or worry about the mileage and its Kelly Blue Book value. This book is a great how-to of living economically without all the mind-numbing jargon of your Economics class. This is a lovely family story of the ‘eating locally’ movement, aka ‘grow your own’. It should also be noted that the Kingsolver/Hopp family did all this on a fairly large plot of land in a part of the country that receives rain during the summer. It’s lovely to read about but not entirely do-able for everyone. And for the most part, they’re not expecting you to be almost-pro farmers, either. The suggestions for eating locally and seasonally (which you can do, thanks to your local farmer’s markets) are wonderful, and accompanied by simple menus as well. I highly recommend, if circumstances allow, listening to this book, since Ms. Barbara reads it herself in her lovely, soft-spoken and ever-so-slightly lilting southern voice. The book is not only informative and directive, but a wonderful story, too. Absorb whichever layers suit you best. What I love about this book, besides the huge amount of helpful tips and details, is that it’s handy and stylish. What could be more Lifestyles of the Destitute and Obscure? And furthermore, she redefines ‘thrifty’, condemned the idea that it be synonymous with ‘cheap’—a word that makes me cringe. 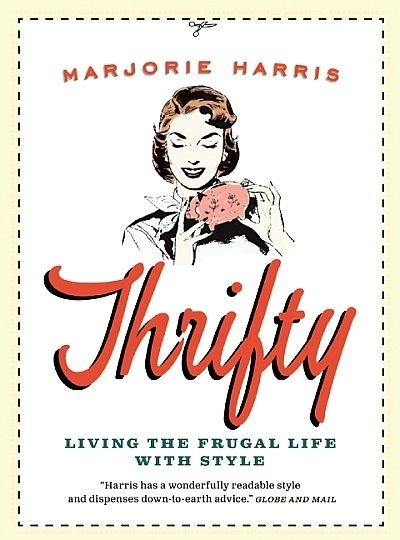 “Being thrifty requires a brain; being cheap doesn’t,” says Harris. My thoughts exactly, thank you. She has all kinds of amazing ideas she has gathered, as well as lots of thoughtful insights from her friends, about being thrifty at home, while travelling, and in fashion as well. Originally a writer of gardening columns, Harris also has a ton of recommendations for gardening and cooking, too, including a book entitled Thrifty Gardening: From the Ground Up. She advocates my all-time favorite must-do tip for grocery shopping and cooking—shop with a list (for heaven’s sake!). And her idea of having dinner guests is right up my alley, too. “My theory about entertaining is that if you have one lovely thing to eat, masses of candles, enough wine and great company, you can’t help having a spectacular time.” Words to live by. I will read, with delicious pleasure, anything that Michael Pollan writes. And if it’s got pictures, then so much the better. And pictures by Maira Kalman! How can this handy little book be anything but a joy? (She illustrated a great edition of Elements of Style, for which you will find a handy little review if you click on the highlighted title/linkage.) This is a wonderful book to cruise through and live by, post snippets on your wall and steal from in order to make quick, witty Facebook posts, such as Rule #22— ‘It’s Not Food if It Arrived Through the Window of Your Car’ or one that most can’t help but love, Rule #52—‘Have a Glass of Wine with Dinner.’ Food Rules makes a great gift and a fun read-aloud while enjoying that glass of wine with dinner and entertaining friends (see Marjorie Harris’ recommendations above). Maira Kalman’s pictures of food, including a Thomas Jefferson’s colander full of peas, make the reading even more delicious. Yay! I love bike commuters. I’m married to one of those, too. Cheers, from one thrifty gal to another!